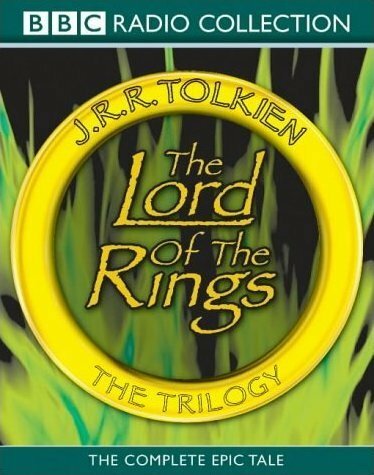 In 1981 the UK radio station BBC Radio 4 broadcast a dramatisation of J. R. R. Tolkien's The Lord of the Rings in 26 half-hour stereo instalments. This followed a previous 12-part BBC Radio adaptation in 1955 and 1956, of which no recordings are known to have survived, and a 1979 recording by National Public Radio in the USA. Like the novel on which it is based, The Lord of the Rings is the story of an epic struggle against the Dark Lord Sauron of Mordor, the primary villain of the work, who created a Ruling Ring to control the nineteen Rings of Power, and an alliance of heroes who join forces to save the world from falling under his shadow. * At one point, Minas Anor and Minas Tirith are referred to as though they were separate cities; Minas Anor is the original name for Minas Tirith. This was when Gandalf and Pippin were discussing the palantír whilst en route to Minas Tirith. * The radio serial omits the sequence in the book in which the hobbits visit Tom Bombadil. This sequence was also excised from the Peter Jackson film version, because Jackson claimed it contributed nothing to the long-range narrative of the story. However, the scene was dramatised, in a similar style but with different actors, in a later series of Tolkien radio adaptations by Sibley entitled The Adventures of Tom Bombadil (a title otherwise only loosely connected with the book of the same name). * The sub-plot which (in the book The Fellowship of the Ring) explained how Merry, Pippin and Sam knew about the Ring and the journey to Mordor was somewhat edited for the radio dramatisation, in which Gandalf arrives at the Shire one evening, and explains to Frodo the following morning about the Ring. This is overheard by Sam, who is gardening outside the window. Gandalf catches him at it, and so he and Frodo threaten punishment if he breathes a word to anyone, and that he should travel with Frodo to Mordor. Later in the story, when Merry and Pippin are explaining to Frodo how come they know so much, they reveal that Sam was the source of the information, but the information "dried up" after Gandalf caught him. In the book, it is explained that there was a lot of investigation going on prior to Gandalf's return to the Shire. This was not explained in the radio production, so the impression is given that prior to Gandalf's return, Frodo, Sam, Merry and Pippin knew nothing of the significance of the Ring. Gandalf's explanation was heard by Frodo and Sam, but not by Merry and Pippin. Yet Merry and Pippin knew about it all, despite the fact that they stated that Sam had stopped giving them information after Gandalf caught him eavesdropping. * Gandalf refers to the Balrog of Moria as a servant of Sauron. * The story includes an arc where Wormtongue is waylaid by the Ringwraiths: this only appears in Unfinished Tales, not the novel. 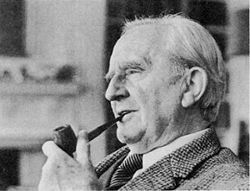 * In the final episode, Bilbo performs Bilbo's Last Song, a Tolkien poem which does not appear in the novel.